While you are at the World Economic Forum in Davos, with the global business elite, you should think about the fact that less than US$0.01 per cup of coffee drunk in Davos helps "Improve the State of the World". 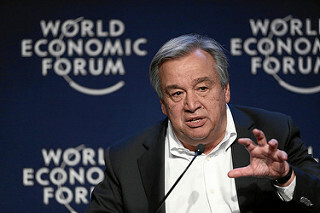 Poverty and extreme poverty in many cases are the consequence of exploitative business models of multinational corporations that claim to be ethical and also say that they support the SDGs. Their business models perpetuate poverty in rural communities, concentrating profits in developed nations. I wrote to your predecessor in July 2016 requesting that the United Nations audits the impact of its supply chain in the Sustainable Development Goals that it supports and promotes. I also requested that the Secretary General encourage every government and multilateral institution to do the same. Mr. Ban Ki Moon ignored my requests. I hope that you consider my requests with the seriousness they deserve. Procurement and consumption by the United Nations, The World Bank, The IMF, the OECD, by other multilateral institutions and by every government should and must be exemplary and be aligned with its policies to eradicate poverty and defend the Convention of the Rights of the Child and the human rights of all, in all corners of the planet. Today less than US$0.01 per cup of coffee, tea and chocolate consumed by United Nations personnel in New York, Geneva, Vienna, etc, helps reduce poverty in the rural areas that produce them. The shared value of so-called 'Fairtrade' products is both insignificant and unacceptable, and perpetuates a cruel form of 'poverty light' in the people that produce them. I encourage you and the United Nations to support the creation of WeShare, a transparent shared value system to help eradicate poverty and create a rural middle class in the communities that produce coffee, tea and cacao with compensation of at least 10CentsPerCup. This amount represents more than 30 times the premium of what some dare to call 'fair trade'. Compensation of 10CentsPerCup consumed in developed nations could dramatically improve the lives of hundreds of millions of people whose livelihood depends directly or indirectly on the production of these three commodities. 10centsPerCup could bring living wages, running water, education, proper healthcare and even crop insurance and social security to all farmers and farmworkers. Sadly, hundreds of millions of farmworkers earn daily wages that are lower than the price of a cup of coffee, tea or chocolate in New York or Geneva, while the industries they supply in developed nations accumulate tens of billions of dollars in profits every year. Their work also helps generate tens of billions in taxes in developed nations. Were you personally to decide, as a symbolic gesture, to share compensation of 10CentsPerCup of coffee, tea and cacao with the communities that produce them, this could end up being a watershed moment that transforms the neo-colonial and exploitative business models of these and other industries. Exemplary leadership is required at this time. The United Nations sharing 10CentsPerCup institutionally would trigger a global debate about how we must put an end to consuming products that depend on abusive labor practices and exploitative business models. You know very well that 10CentsPerCup is an insignificant amount compared to the average income of UN employees and all diplomats. I hope you agree with me that what the world needs, to end inequality and extreme poverty and reach and surpass the SDGs, is a transparent shared value system in global trade and not glitz at the UN or buzz in the media. No cup of coffee, tea and cacao or any other product should be considered ethical, sustainable or fair until all girls in the communities that produce them can attend secondary school. Gender Equality is a myth unless all young women have access to education. Today there is hunger, malnutrition and unacceptable levels of infant mortality in the coffee, tea and cacao lands. In the Ivory Coast, the world's leading producer of cacao, a baby girl has a higher probability of dying before reaching age one than ever graduating from secondary school. Your mandate just started, you can make United Nations known for the impact of its exemplary actions and not by its many meetings, declarations and multiple goals. I thank you in advance for your consideration to my request and look forward to your 10CentsPerCup of coffee, tea and chocolate.